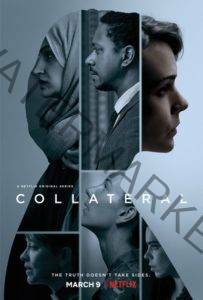 New limited series Collateral, starring Academy, Golden Globe and Screen Actors Guild Award nominated actress Carey Mulligan, and written by Academy, Golden Globe and Tony Award nominated Playwright, Screenwriter and Director David Hare (The Hours, The Reader) and directed by SJ Clarkson (Marvel’s Jessica Jones, The Defenders), launches globally – outside of the UK – on Netflix March 9. In Collateral, a young man is shot dead delivering a pizza in South London. The detective in charge, DI Kip Glaspie (Carey Mulligan), quickly discovers that the pizza manager inexplicably sent Syrian refugee Abdullah Asif (Sam Otto) instead of the regular delivery driver. The killing seems professional but the only witness, a young woman strung out on drugs on the street corner, gives the police a false name and address. Kip tracks down Abdullah’s home, a set of garages, to find his sisters. They are scared and Kip’s convinced they’re hiding something. Set over the course of four days, the spiraling repercussions surrounding Abdullah’s murder are explored. Politician David Mars (John Simm) becomes instantly embroiled in the drama through his turbulent relationship with his ex-wife Karen who took delivery of the pizza. While Jane Oliver (Nicola Walker), a compassionate vicar, struggles to conceal her affair with the sole witness to the crime. Refusing to accept this is a random act of senseless violence, Kip is determined to discover if there is a darker truth, as the death of one individual, who has lived out of the sight of respectable society, begins to resonate through the institutions that shape our lives.